Another week, another successful search for a couple of quarterbacks who look like they're trying to make out through their facemasks. For the gambling degenerates, here are my Week 9 NFL picks. To note, the team logos indicate who I think will win the game, not cover the spread. At the end of the picks, I'll note a few teams that I like based on the spread. Raiders at 49ers (-3): The only people who care about this game are Giants fans, who are now only interested in draft position. If the season ended today, by the way, the draft order would go (1) 49ers, (2) Giants, (3) Raiders, (4) Cardinals, (5) Bills. Bears (-10) at Bills: The Bears have proven that they're still probably a ways away from serious contention, but the Bills have the worst point differential in the NFL, at -113, hence the 10-point spread that I'm not touching with a 10-foot pole. Buccaneers at Panthers (-6.5): The Buccaneers are a terribly run team, as they have little shot of contending this season, but refused to trade DeSean Jackson for a valuable asset down the road because the head coach and general manager are trying to save their jobs, as they foolishly remain in "win now" mode. It doesn't matter. They don't have a roster that can win enough games to seriously contend. Chiefs (-8) at Browns: So this line is only 8, huh? Tempting, but I'm scared of one-week aberrations that can occur after a coaching staff shakeup. Pass. Jets at Dolphins (-3): The Jets are worth considering with Brock Osweiler starting for the Dolphins, but they're just too erratic themselves. I'll take the safe play, and just pick the home team. Steelers at Ravens (-3): A month ago against the Steelers, Joe Flacco went 28 of 42 for 363 yards, 2 TD, and 0 INT. In recent weeks, he's looked a lot more like, you know, Joe Flacco. The Steelers have won three straight, and look like a team with positive momentum, despite the season-long LeVeon Bell nonsense. I like them to even this series on the road in Baltimore. Lions at Vikings (-4.5): In a move to acquire a valuable asset for the future, the Lions traded Golden Tate, very much making them sellers at the trade deadline. It was the right move, but Matt Patricia tried to explain to his players that they made the deal party because they have confidence in their backups to come in and produce in Tate's place. Stop. Players aren't stupid. They see that move exactly for what it is, so just own it. They're not children and you shouldn't talk to them like they are. Falcons at WASTEAM (-1.5): This is a huge game for the Falcons, who climbed back from a 1-4 start to get to 3-4 before their bye. Like the Eagles, the Falcons are very banged up, and they should be healthier after their bye. WASTEAM's biggest strength so far this season (stopping the run) doesn't really matter in this game, as the Falcons haven't been able to run it all year anyway. Ultimately, the Falcons are the better team, in my view, and they are still desperate for wins, which makes them dangerous. Oh and by the way, Matt Ryan has been awesome this season (15 TD, 2 INT) after looking a little washed-up Week 1 in Philly. Texans at Broncos (-2.5): Wait. How is this crap Broncos team favored over anybody? Is their quarterback suddenly not Case Keenum? Chargers at Seahawks (-1.5): I've been a sucker for road "underdogs" who are better than the teams they are playing, and those have been paying off all year, so I think I'll stick with that, as the Chargers are the much more talented team here. 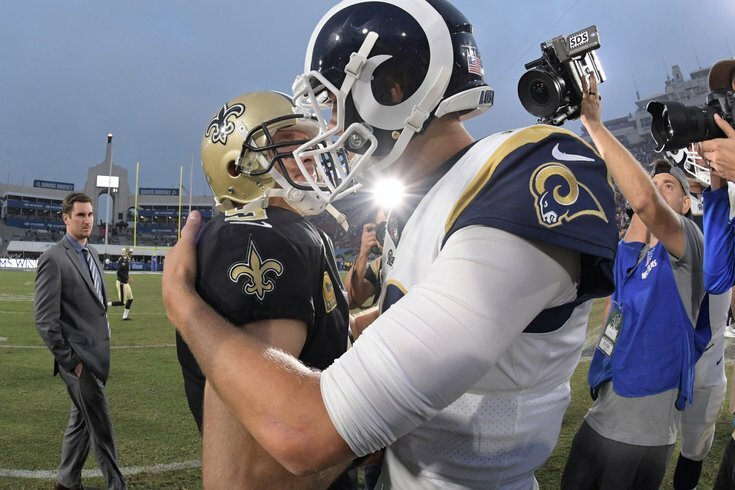 Rams at Saints (-2): I'm not picking the Rams to lose a game until they actually lose a game, and if you're also going to give me 2 points, I'll take them, thanks. Packers at Patriots (-6.5): This is a matchup of a couple teams with all-timer quarterbacks and overrated surrounding casts. The difference is the cheating hoodie-wearing coach is better than the coach on the other sideline who should really just get out of Aaron Rodgers' way. Titans at Cowboys (-6.5): Both of these teams are coming off their bye, so this Monday night game only hurts their week of prep heading into next week, when oh by the way, the Cowboys have to travel to Philly to face the Eagles. Anyway, the Titans stink, and the Cowboys should be able to take care of them at home. Byes: Bengals, Colts, Giants, Eagles, Cardinals, Jaguars. • Picks against the spread: Steelers (+3), Falcons (+1.5), Texans (+2.5), Rams (+2), Chargers (+1.5).